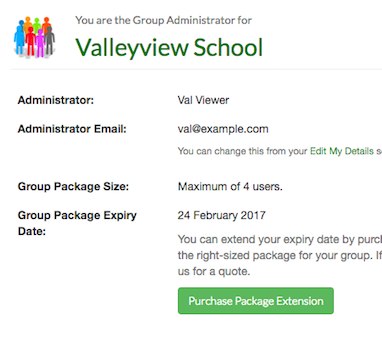 Access to a Group Administrator Dashboard to manage your school's group. * Discounts are in comparison to purchasing individual annual prepaid upgrades for each teacher. Use the School Purchasing Calculator below to select the number of accounts you require then choose your method of payment. Once we've received your order we'll contact you by e-mail to set up your user accounts. Group purchases are processed manually, so please allow 1 business day for this to happen. If you have any questions please don't hesitate to get in touch! We'll be delighted to help. Please note that, due to administrative overhead, the money back guarantee available for individual prepaid purchases does not apply to School Group Purchases. Premium Accounts purchased as part of a package are Annual Prepaid accounts valid for a period of one year. Enter the number of accounts you require below to calculate the cost, then choose your payment method.